You'll be £44.00 closer to your next £10.00 credit when you purchase Battleship Bismarck. What's this? 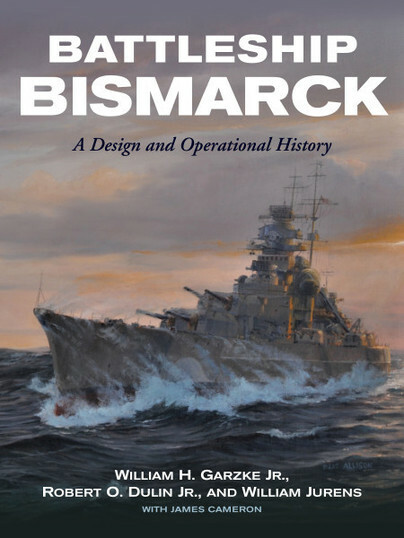 This new book on Bismarck offers a forensic analysis of the design, operation and loss of Germany’s greatest battleship and draws on survivors’ accounts and the authors" combined decades of experience in naval architecture and command at sea. Their investigation into every aspect of this battleship has taken fifty-six years of painstaking research, during which time they conducted extensive interviews and corresponded with the ship’s designers and the survivors of the battle of the Denmark Strait and Bismarck’s final battle. Albert Schnarke, for instance, the former gunnery officer of Tirpitz, Bismarck’s sister ship, aided the authors greatly by translating and supplying manuscript materials from those who had participated in the design and operations. Survivors of Bismarck’s engagements contributed to this comprehensive study including D B H Wildish, RN, damage control officer aboard HMS Prince of Wales, who located photographs of battle damage to his ship. After the wreck of Bismarck was discovered in June 1989, the authors served as technical consultants to Dr Robert Ballard, who led three trips to the site. Film maker and explorer James Cameron has contributed a chapter, which gives the reader a comprehensive overview of his deep-sea explorations on Bismarck and it is illustrated with his team’s remarkable photographs of the wreck. James Cameron is a Canadian film maker and deep-sea explorer. Robert O Dulin is a graduate of the US Naval Academy and later earned his MS in naval architecture and marine engineering from MIT. William H Garzke is a graduate of the of the University of Michigan with a degree in naval architecture and marine engineering. William J Jurens currently serves as an associate editor for Warship International.